The Israeli military boasted Friday afternoon that it had carried out more than 500 air strikes against the densely populated territory of Gaza since launching its latest offensive, dubbed Pillar of Defense. The escalating air war is unfolding amid growing signs that the Israeli government is on the brink of launching a ground invasion of Gaza that would spell a huge increase in the bloodletting. The relentless bombardment has resulted in widespread destruction and carnage, with the official death toll rising to 29 on Friday night and the number of wounded climbing to 300. Among the latest to be killed was a two-year-old Palestinian boy. The majority of the dead and wounded are civilians, including eight children and a pregnant woman. The Israeli government and military have incessantly declared that the strikes on Gaza are aimed solely at “terrorists” and that any civilian casualties are the fault of Hamas for “hiding” among the people. The reality, however, is that the bombs and missiles are destroying homes, schools, workplaces, government office buildings and police stations. It was confirmed Friday that the Israeli military sent text messages to at least 12,000 cell phones inside Gaza issuing warnings to stay away from anyone connected to Hamas, which runs the government of the 25-mile-long territory, or face possible death. 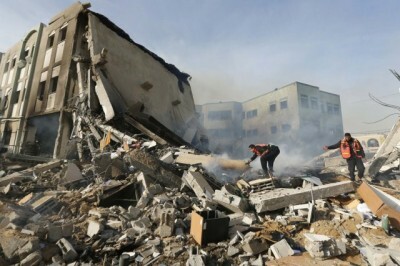 Among the targets demolished on Friday was the civil affairs department of the Ministry of the Interior in Gaza City, which houses 70 years’ worth of records of the Palestinian civil registry. Also hit were a family-owned textile factory that employed 20 people and a food store. In response to the Israeli assault, Palestinian resistance groups fired rockets into Israel. Though largely ineffectual, one of them struck the Tel Aviv area Friday, while another landed near Gush Etzion, an illegal Zionist settlement near Jerusalem in the occupied West Bank. On Wednesday, a rocket struck an apartment house in the southern town of Kiryat Malachi, killing two Israeli women and one man. There is every indication that the first three days of terror unleashed by the Israeli state on Gaza is only the beginning. “We are going to significantly aggravate the operation,” a senior official told the Israeli media. The threat came after the cabinet of Prime Minister Benjamin Netanyahu approved a request to call up 75,000 reservists. During the last ground invasion of Gaza, the 2008-2009 Operation Cast Lead, which claimed the lives of some 1,400 Palestinians, the government called up only 10,000. The Israeli military has barred civilian use of the main highway leading to Gaza as well as two roads bordering the impoverished fenced-in enclave. Tanks, armored cars and self-propelled guns have been massed along the border. A Hamas spokesman vowed that any invasion would be resisted. “The Israelis should be aware of the grave results of such a raid, and they should bring their body bags,” said Hamas spokesman Sami Abu Zuhri. Meanwhile, Israel’s Home Front Command has issued instructions to municipal authorities to make civil defense preparations for seven weeks of war in Gaza. The last war against Gaza nearly four years ago lasted three weeks from the beginning of the air strikes to the end of the ground invasion. Even after just three days, the Israeli blitzkrieg has raised the specter of a humanitarian catastrophe in Gaza, whose population of 1.7 million has been subjected to an unrelenting Israeli blockade. As recently released documents have exposed, the Israeli government has gone so far as to calculate the minimum number of calories needed to avoid chronic malnutrition to determine the amount of food supplies allowed into the territory. Doctors in Gaza’s hospitals have warned that they are already overwhelmed by the number of casualties inflicted by the Israeli offensive, and that critical medicines and supplies are quickly running out. On Friday, the Palestinian Authority’s health minister, Hani Abdeen, reported that the Israeli military was refusing to allow access to Gaza by a 15-truck convoy carrying medicine and medical supplies sent by the Ramallah-based administration. There is an element of extreme recklessness in the latest campaign of Israeli military aggression. The claim that it was compelled to launch the offensive by rocket attacks from Gaza is a patent lie. Israeli officials admitted that these attacks, which until Wednesday’s retaliatory strike had caused not a single death this year, had largely abated when Operation Pillar of Defense was launched with the assassination of the Hamas military leader, Ahmed Jabari. Underlying the deliberate provocation of another war are calculations within the Netanyahu government that an eruption of militarism will serve to divert growing social tensions in Israel. The country is characterized by some of the highest levels of poverty and inequality in the developed world, with 75 percent of workers earning $1,700 or less a month and barely 20 families controlling the bulk of the economy. Conditions have substantially worsened under the impact of the global economic crisis and the right-wing economic and social policies of the Netanyahu government. Many have charged that Netanyahu is playing a cynical game in launching the war only weeks before national elections set for January. In reality, his right-wing coalition faces no major opposition from within the Zionist political setup. Of far greater concern is an eruption of class struggle and social protest from below. The operation, he continued, allows Israel’s military commanders to test out weapons and tactics that would be used in an attack on Iran. It also allows Israel to gauge international reaction. It also has the potential of derailing any bid by the Obama administration to enter into talks for a deal with Teheran on the Iranian nuclear program. The other front being watched from Tel Aviv is the reaction of the Arab bourgeois regimes, including the Muslim Brotherhood administration of President Mohamed Mursi. Friday saw a brief visit to Gaza by Egypt’s prime minister, Hisham Kandil, but, significantly, not Mursi himself. The Mursi government has given no indication that it is preparing to break its Camp David treaty with Israel or take the concrete step of opening up its border with Gaza to allow aid, both military and humanitarian, to flow in. The Arab League is set to meet on the Gaza crisis in Cairo on Monday. In anticipation of the meeting, Iraq’s envoy, Qais el-Azzawy, issued a statement Friday calling upon the Arab states to use the “oil weapon” to exert pressure on Israel and its allies, principally the US. Several hours later, however, his office repudiated the remark and affirmed that Iraq had no proposal to present to the Arab League. This is an accurate reflection of the attitude of all of the regimes of the Arab bourgeoisie, many of which see the massacre in Gaza as an unwelcome distraction from their participation in the US-backed war for regime-change in Syria. Among masses of working people in the region, however, the attack on the people of Gaza and the perfidy of the ruling classes in their countries are creating growing anger and unrest, reflected in demonstrations held Friday in Lebanon, Egypt, Yemen and elsewhere denouncing the Israeli attack.